Last week, Marvel wrapped production on Avengers: Infinity War, which was signified by the Russo Brothers declaring, "One down" on social media. With post-production getting under way, a new photo has leaked. The image in question was taken from a monitor, which features four separate shots, three of which are indistinguishable. 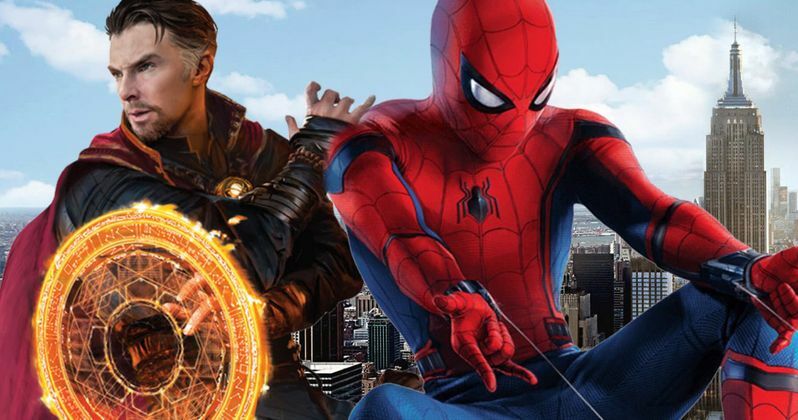 The fourth, photo, however, showcases a CGI shot with Doctor Strange (Benedict Cumberbatch) and Spider-Man (Tom Holland) working together. Although there is a very cryptic caption in place. If you want to avoid SPOILERS, stop reading right now. Like many videos and photos from unconfirmed sources these days, this image surfaced on Reddit, which features a caption that shows the dialogue spoken by Doctor Strange in this particular scene, where it appears that Doctor Strange is flying up towards Spider-Man. Unfortunately, we can't make out anything in the background of this shot, but here's what Doctor Strange tells young Peter Parker in this scene. "Peter! Protect them. They're not dead." Now, since we can't see anything in the background, and there is no idea what happened just before this scene, it's virtually impossible to try and figure out who Doctor Strange wants Spider-Man to protect. Still, fans shouldn't be too surprised to see these two team up. After all, they're both based in New York, with Stephen Strange's Sanctum Sanctorum in the Greenwich Village neighborhood of Manhattan, while Peter resides in Queens with his Aunt May. We also saw the good Doctor hanging out with another famous New York City superhero, Tony Stark (Robert Downey Jr.), Strange's colleague Wong (Benedict Wong) and a non-Hulked out Bruce Banner (Mark Ruffalo) in recent set photos. As for who the "them" are, it could be anyone from your average New York denizens who have been put in danger by the Mad Titan known as Thanos (Josh Brolin), or it possibly could be a group of severely injured Marvel heroes. Given the power that Thanos can wield with all of the Infinity Stones in place on the Infinity Gauntlet, there has been speculation that a number of the original Avengers, who have been in the MCU since Phase 1, could be killed off in this epic battle, especially since several of these actors' Marvel contracts are either expired or winding down. Still, we most likely won't find out who will live and who will die until Avengers: Infinity War hits theaters on May 4, 2018. Even if this image is legitimate, there is certainly no guarantee it will make it into the finished film. At one point, Marvel had planned on shooting both Avengers: Infinity War and Avengers 4 back-to-back, but that plan was scrapped in favor of shooting both movies individually, with a brief break in between. Production on Avengers 4 is expected to last the rest of this year. Marvel debuted the first footage from Infinity War at D23 last weekend, and it seems likely that the cast and crew will assemble in San Diego this week for Comic-Con 2017, with Marvel Studios holding a massive 90-minute panel on Saturday, July 22 from 5:30 PM to 7 PM. Take a look at this leaked photo from Avengers: Infinity War, as we get closer to the SDCC panel this weekend.